InPlay Technologies is the provider of FinePoint and DuraSwitch technologies. By incorporating a digitizer board and active RF digital pen, FinePoint system can be applied to various pen computing solutions. Also, the company delivers innovative switching technology combining the benefits of electromechanical and flat panel membrane switches. Nowadays, it has expanded its FinePoint system, enabling dual mode pen and touch input solutions. MPCD970 and MPRD950 couples its active pen technology with capacitive touch and resistive touch sensing, respectively. 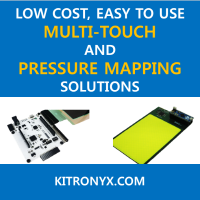 MPCD970 also have great features such as proxmity sensing (up to 2mm) and multitouch capability.